Should You Fake It Till You Make It ? Should You Fake It Till You Make It? Fake it till you make it. It’s a phrase that is spewed quite a bit in the entrepreneurial world. I’m sure you’ve heard it. If for any reason that you haven’t it means exactly what it says…. If you haven’t “made it” in your business/ life then you fake it until you do. But what I’ve found kind of interesting is that I don’t feel that a lot of people have stopped to think if it’s actually a good thing to do that. Now I personally know people who have faked it until they made it. And now in business they are crushing it. So much so that they repeat this phrase quite a bit. On the other hand there are probably way more people faking it because they haven’t made it… yet. And more than anything I want those people to “make it” and achieve their goals. But what happens when you fake it for a VERY long time? What happens once you’ve been faking it for years and then all of a sudden you’ve made it? In this episode I spend a few minutes actually sharing whether or not it’s a good idea to fake it till you make it. And I’ll answer those two questions above. What you’ll hear may be a bit different than what you think, and may be different from what others say. Because of this it may open up a new level of awareness for you. What is faking it till you make it. Who should fake it till they make it. Why doing this is a good thing. What happens when you fake it for too long. 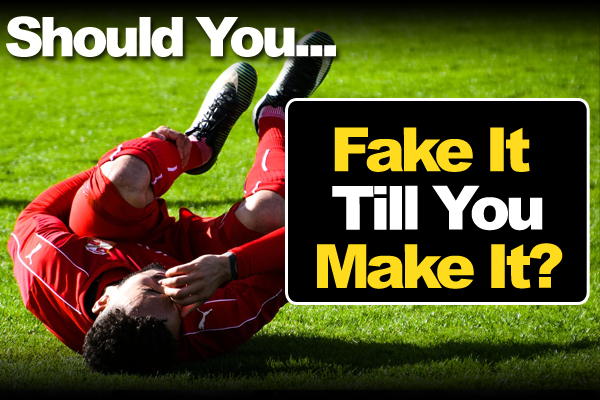 What you should do if you’ve been faking it for too long. What if you never make it? How does influence play into this. What happens when you do make it after faking it? How this philosophy continues to be spread like wildfire within entrepreneurial circles. Who are the ones that are really pushing this philosophy. After years of researching this, and personal experience I find this topic absolutely fascinating. I’m hoping you find this episode just as interesting. There are so many things that entrepreneurs face, and are influenced by, that even the smallest things like faking it till you make it can have a huge impact. So check out this episode and let me know what you think on the whole fake it till you make it philosphy.